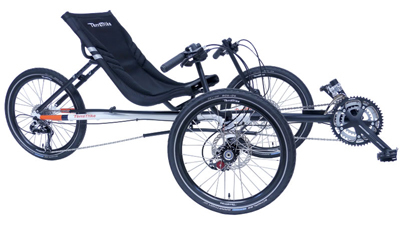 The TerraTrike Rambler takes the Rover’s friendly, accessible design and makes it lighter and more stylish, now with the NuVinci N380 hub. The Rambler has become Terratrike’s paradigmatic trike. It began as a refinement of the remarkable Rover design, and has become the platform from which TerraTrike launches their new innovations. 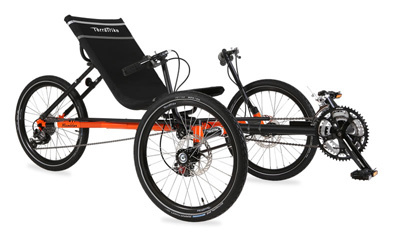 Now we also have a folding Rambler (the Traveler), all-terrain Ramblers (the All-Terrain and Rambler All-Road) and an electric Rambler (the Rambler EVO). But it all started with this one here. 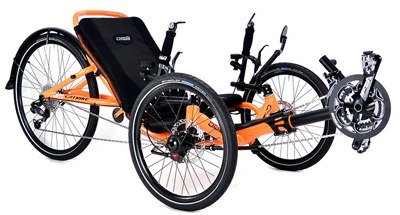 Like the Rover, the Rambler has a high, upright, highly-adjustable seat position. It has lower cranks and horizontally-aligned direct steering handlebars. 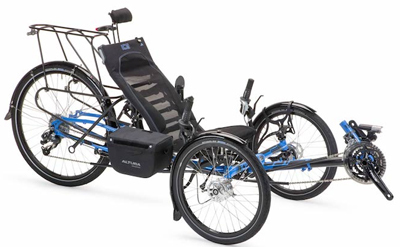 Both the frame and the seat’s position on the frame adjust, allowing for optimized fit for both your leg length and your reach to the handlebars. The Rambler has a generous 300 pound weight capacity. The Rambler is available in several different specification levels. We stock the N380 model, featuring the wide-range NuVinci N380 continuously variable hub. We can also supply it with in the x16 or x30 spec, with traditional front and rear derailers, giving a wider range of gears for hillier riding. The Rambler is well-suited for casual cruising, but can be called upon for longer rides or bigger hills. 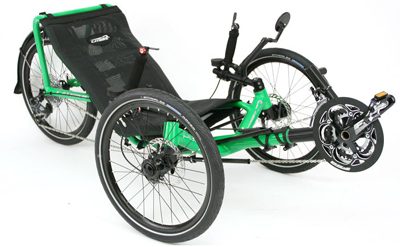 If you like the idea of the Rover but want a trike you can grow with, look here. Ramble on…. After releasing the Rover and opening the door for people who never thought they’d enjoy cycling again, we found many customers wanted more. So that’s just what we gave them. 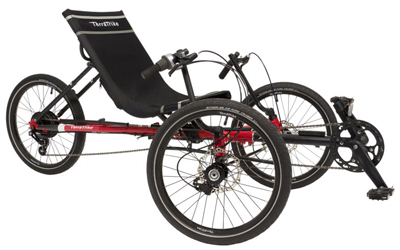 The Rambler has the same high seat and straight-forward frame geometry as the Rover, but with many upgrades for riders who want to go faster and farther. It features a sleek Y-frame design which improves the Rambler’s handling and stability. It is available with up to 30 speeds, and is about eight pounds lighter than the Rover. The Rambler is as versatile as it is stylish. It is available in three different component levels: n380 NuVinci, x24, and x30. The single-piece frame made of round chro-moly steel tubing also gives the Rambler a nimble, responsive ride. 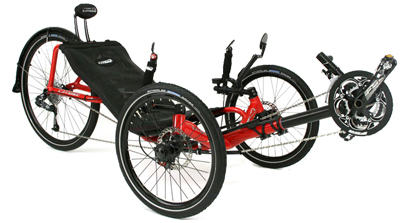 The seat mesh is breathable and is fitted across a lightweight aluminum seat frame. Along with standard disc brakes and full seat adjustability, the Rambler is a quality machine for casual and serious riders alike. The frame comes in a stunning Tangerine Orange or Arctic White finish (x30 level only) with complimenting graphics.